Our August 2015 release slate has finally been announced, and it features a ton of great stuff to look forward to come Summer. The legendary Vampire Hunter D will rise from its grave with an HD remaster sourced from the original elements and with an all new English dub! A new collection of Space Brothers, as well as the last collections for Haikyu!! and Captain Earth are also coming your way, along with more Rikka, Deko, Kumin and Morisummer in Love, Chunibyo & Other Delusions - Hearth Throb. 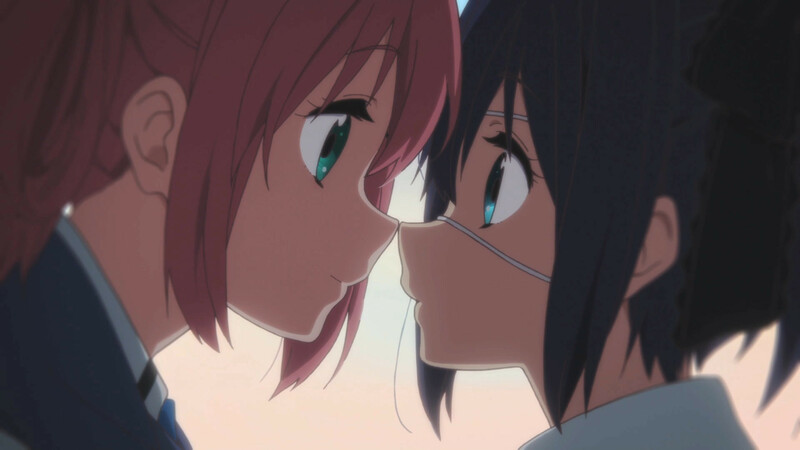 SYNOPSIS: Haruka and Yuu have been best friends forever and they've always sat next to each other in class since… well, since they were just girls in junior high anyway. But on their first day of high school, they're stunned to learn that the new seating plan has them on opposite sides of the classroom! So, since everyone knows that long distance relationships won't work unless the parties involved put extra effort into it, they decide they need to do something extra special to permanently seal their friendship. However, deciding to kiss each other awakens a whole new level of feelings, and it doesn't help that some of their classmates seem to be 'involved" in similar circumstances. So what's a girl to do when her best girl friend suddenly seems more like a girlfriend? It's a life lesson that the school curriculum isn't normally prepared to teach, except maybe in French class, and our two young heroines are about to get a private education you'll never forget! Discover the truth about the birds and the... er… birds, as two young ladies learn to deal with the pros and cons of intramural osculation in SAKURA TRICK! SYNOPSIS: Things are looking grim for Earth's defenders. Although Daichi and Teppai have managed to slow or stop most of the Planetary Gear's direct attacks so far using their Impacters and Livlasters, there's no denying that the numbers are slowly turning against them. Not only have their opponents managed to recruit a half dozen of the Designer Children, but now new cracks are forming in the Midsummer's Knights' own alliance. During a brief break at the seaside, Hana's confusion over her own nature and her relationship with Daichi comes to a head, leading to an unexpected revelation. But as stunned as Daichi might be, it's nothing compared to the shock that Kube is about to receive at the hands of his own allies. Twists, betrayals and amazing new powers are about to be unleashed, a new Livlaster joins the Knights, and Setsuna finally comes out of seclusion to let loose her own brand of mayhem as the war for Earth's Orgone energy builds to the inevitable climax. It's anyone's guess as to who'll come out on top as the final battle for our planet explodes in the world-shattering second collection of CAPTAIN EARTH! SYNOPSIS: In the wake of the blistering practice match against the Nekoma High School team, the Karasuno High School volleyball squad digs in and vows to bring their game up another level. Prior to the arrival of the new freshmen, the general belief was that Karasuno's day in the sun was over, but while the ongoing rivalry between Hinata and Kageyama has inspired everyone to push themselves even further, there's still a lot of friction that's ultimately slowing down their game. It's not until the announcement of the brackets for the Inter-School tourney are announced that the reality of what they are attempting to do finally takes hold. As talented as each of the team members may be individually, they have no chance of winning unless they can finally come together as a seamless unit. Can Hinata and Kageyama put their battle for dominance on hold long enough to take on the overwhelming brilliance of the Aoba Johsai squad? The aces are high and the kills are merciless as Karasuno explodes off the court in the second thundering collection of HAIKYU!! SYNOPSIS: Some say a home is where your heart is. Others say that a home is where you send people whose brains aren't functioning quite properly. So, when Kazunari Usa's parents send him to the Kawai Boarding House while they work abroad, it may take a while to figure out whether this is really his new home, let alone what kind of home it is. On the one hand, his new roommate is a pervert and a masochist who peeps at girls' schools, while his new landlady thinks leaving a variety of weapons lying around the girl's area is a proper form of feminine protection. And when it comes to the trouble-making college girl and the perpetually grumpy working woman… well, let's just say that those two have some serious issues to work out. On the other hand, Kawai is also home to Ritsu Kawai, who stole Usa's heart from the first second he saw her on his first day at his new high school. And that alone may just make living in this strange new house worth every second it takes to learn the complex rules of The Kawai Complex Guide to Manors & Hostel Behavior! SYNOPSIS: Could Hayate Ayasaki's life get any unluckier? As if it wasn't bad enough that he's had to work constantly in order to support his good-for-nothing parents, now he's lost his job for being underage and Mom and Pop have cashed in their cash cow by selling him to the Yakuza. For Christmas! Desperate to pay off the 156,804,000 yen debt before he's converted into black market organ parts, Hayate strikes on the idea of kidnapping oddball heiress Nagi Sanzenin. Unbelievably, however, even that goes wrong and not only does he end up not kidnapping her, he rescues her from other kidnappers. (Apparently this happens to her all the time.) But maybe, just maybe, there might be a tiny, dim light at the end of the very dark tunnel of Hayate's existence, and the skills that Hayate's had to develop to stay alive will pay off. Because Nagi needs a butler/bodyguard and Hayate could just fit the bill. Assuming he can survive the on-the-job training, of course. Fate can be a harsh mistress, but Hayate may have just signed up with an even harsher one as the epic comedy series begins in HAYATE THE COMBAT BUTLER! SYNOPSIS: Yui Kusanagi isn't sure what to do after high school, but when Zeus decides that the Gods have lost touch with the mortal world, he stages a bit of divine intervention and places Yui on the path to education. Okay, it's more like he drops her into a mysterious garden and tasks her with teaching eight moody and extremely hot young Gods about life, humanity and love. Or else. That's quite a burden for any mortal girl, especially when the gorgeous Godly gaggle are eight heavy hitters from Greek, Norse, Egyptian and Japanese mythology: Appollon, Hades, Dionysus, Thor, Loki, Balder, Thoth, Anubis, Susanoo, and Tsukiyomi! But while they're all afflicted with the angst and capricious whims one might expect from such immortal archetypes, and while their "schooling" is further hampered as the mysterious world they're all trapped in keeps changing unexpectedly, Yui's going to give this her all. Why? Maybe because she's the only girl they're going to see in at least a year and did we mention that they're all totally babe-a-licious? Prepare to say O.M.G. with multiple Os and eight different Gs as higher education hits the highest plane in KAMIGAMI NO ASOBI! SYNOPSIS: Yuta Togashi thought he had problems dealing with one delusional girlfriend in the person of Rikka Takanashi, but now things are about to go totally insane as his FORMER "one true soul mate" from when he was a chuuni himself returns with a vengeance! So how bad is Satone Shichimiya's re-entry into Togashi's chuni-verse likely to be? Let's just say that she's so epically off the deep end of the chuni-scale that she prefers to use the name Sophia Ring SP Saturn VII and that she'll joyfully tear Togashi's real world to pieces in order to get him back in her imaginary one! Some girls just want to have fun and some want to break down the walls between their boyfriends and themselves. But when a girl's idea of fun is breaking down the wall between their presumed boyfriend and reality, retreating into a fantasy world might just be Togashi's best option. Especially since Satone knows where ALL the skeletons from his past are buried. Toss Rikka's equally delusional friend Sanae into the mix and girl-crazy takes on a whole new meaning in LOVE, CHUNIBYO & OTHER DELUSIONS - HEART THROB! SYNOPSIS: For 10,000 years, Count Magnus Lee has walked the night, sustained by an unholy thirst for blood and an unending lust for human women. But when he tastes the sweet nectar running through Doris Lang's veins, the Count knows he has found more than his next meal: this is the woman he intends to claim as his next vampire bride. As the daughter of a werewolf hunter, however, Doris Lang is less than willing to step into the thrall of evil. And if she is unable to defend herself from the Count's nightmarish powers, she is fortunate enough to have found someone who can: the Vampire Hunter known as D. But D is no ordinary man, and signing up for his protection may carry a price of its own. Driven by the art of acclaimed designer Yoshitaka Amano (FINAL FANTASY I - VI, the Hugo nominated Neil Gaiman's SANDMAN-THE DREAM HUNTERS), this is the epic animated fantasy that spawned multiple sequels and helped launch the anime revolution. Remastered in high-definition from the original elements and upgraded audio tracks, it's the legendary classic as you've never seen it before in VAMPIRE HUNTER D!